Retronix Ltd.: The Retronix IC Recovery process: Why it will change the landscape of the IC recovery market. The Retronix IC Recovery process: Why it will change the landscape of the IC recovery market. Intel specifies two more points which are relevant, in the above referenced document, point 9.4.4.1 specifies, that the profile goes above 154 deg. after approx 1.9 minutes, and does not come below 154 deg. again till about 6.4 minutes. So it is above that temperature for approx. 4.5 minutes, moreover some profiles are even longer than this. 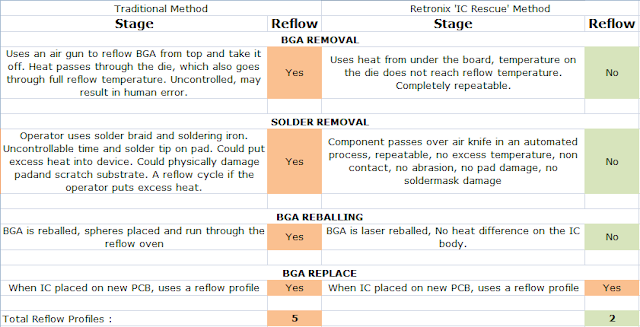 Keeping the above standards in mind, the Retronix IC Rescue process is different and unique as it manages to stay within all the stated manufacturers specifications, much shorter in terms of temperature and time, safe and well below stated reflow profiles. Following comparison shows the traditional method to the Retronix method, and how the Retronix IC recovery method is changing the landscape of the component recovery market. The first time the component goes onto a PCB it has gone through a reflow profile, therefore the count starts from 1. The Retronix IC Rescue method is well within the manufacturers specifications, the process is automated, controlled and completely safe. Additional benefits of Retronix IC Rescue method include an automatic wash which makes sure each IC is clean, a mechanical test to verify functionality, including curve trace test, key functional test and memory test. A solderability test and XRF test to verify composition of leg or ball.